We see a ton of healthcare, medical marketing and hospital websites in our work. We review them, we critique them and we provide advice how to improve them. And sometimes it’s downright frightening what we find. Perhaps the scariest moment is when we discover a provider or healthcare organization that has no website at all. The only good news with that is it’s easier to work from a clean slate. CLARITY OF PURPOSE If you don’t know where you’re going, almost any road will take you there. So begin with the end in mind. In medical marketing, the purpose is often to answer a website visitor’s need in a way that inspires them to take action, typically to call to make an appointment. 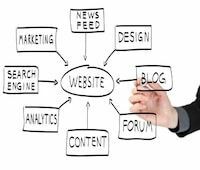 Everything about the website design and function should lead the visitor—directly or indirectly—to that action step. And getting there needs to be intuitive, obvious and easy for the visitor. EASE OF USE In our experience, and in customer polls, the one most important criteria of visitors is that a website should be EASY for them to use. The user is not visiting the site to bestow awards for “pretty” or “flashy.” It’s not easy for the visitor if they are bombarded with clinical information or unnatural navigation. The appearance and functionality of the website design can’t get in the way of what they seek and the solution you provide. Make it easy for them to use. The early test for a website is not artistic “creativity” or beauty of design. An effective, marketing-smart healthcare website is ease of use in achieving a defined purpose. Watch while visitors actually use your site. This isn’t always convenient to arrange, but when you can stand over someone’s shoulders, and monitor how they go through the website, you begin to understand how they interact with what you’ve presented online. This is not a member of the staff or a friend of the family. It should be a typical user. Even better, observe several users.